A Finnish built, family sports cruiser with a price that has been slashed by 45% is on the market from HM Yachts in Cork. The 2007 Finnmaster Grandezza 23DC is a good seaboat with a deep V, ideal for day trips. Possible buyers include those looking to upgrade from a RIB. 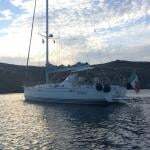 It is capable of coastal cruising and overnight trips thanks to its cuddy arrangement. Afloat.ie podcast with the broker is over the fold. The Grandezza 23 has a large open cockpit with fixed windscreen with opening centre window for access forward. She is fitted with a sprayhood and complete aft closing kit which can fold away. There is a V berth forward with heads. Pilot and co pilot forward facing (swivel seats) and large bench seat aft that can convert into a double berth. Another big plus on this model is its diesel engine, offering more flexibility for refueling than petrol rivals. 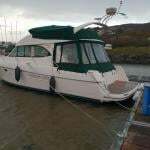 Reduced from Euro 89,000 to Euro 49,000 Afloat's boat of the week is seriously for sale. Listen below to hear what broker Hugh Mockler has to say about this boat. See photographs of the boat, download specs and more information here. Buying or selling a boat? Click here for Ireland's marine marketplace.